Canada’s Constitutional Legacy: ‘Notwithstanding’ its framers? Written by guest blogger, Ben Gilding. It is timely, even more so than I could have possibly intended, that my article emphasising the role of the British Colonial Office in defining the features of Canadian Confederation should be published in the Canadian Historical Review at a time when the constitution—albeit a newer section of it—is once more making headlines. I am, of course, referring to Ontario Premier Doug Ford’s decision to invoke the ‘notwithstanding’ clause in order to push through his reform of Toronto’s municipal elections. The Ontario Superior Court ruled that Ford’s bill violated freedom of expression under Canada’s Charter of Rights and Freedoms, which was entrenched in the constitution during its repatriation in 1982. To combat the Court’s ruling, Ford invoked the ‘notwithstanding’ clause, which allows governments (provincial or federal) to temporarily override rights and freedoms outlined in sections 2 and 7-15 of the Charter. These include freedoms of religion, association, and expression, among others. Since then, it has been revealed that the new Premier-designate of Québec, François Legault is threatening to make use of the same clause to ban the wearing of religious symbols by provincial civil servants, leading the Premier of B.C. to remark on the appearance of a ‘domino effect’ on the use of the controversial clause. Ontario’s recent controversial use of the ‘notwithstanding’ clause has prompted a response from several of the framers of that provision (former Prime Minister Jean Chrétien, former Saskatchewan premier Roy Romanow, and former Chief Justice of Ontario, Roy McMurtry). These three, famously involved in the so-called ‘kitchen accord’, argued that the ‘notwithstanding’ clause “was designed to be invoked in exceptional situations, and only as a last resort after careful consideration.” The assumption behind the release of this joint statement, and much of the commentary in the press and on social media surrounding this controversy suggests that the intentions of the framers matter in constitutional jurisprudence. Not that they ought to rule supreme and fossilize archaic notions into the structure of what would thereby become an increasingly obsolete document; but that they ought to be considered and accounted for in a rational debate concerning the principles that define the national character and the institutions of state. Upon this assumption—that the intentions of the framers matter in constitutional jurisprudence—my article examines the ideas and motivations of what I term ‘the silent framers’ of Canada’s original constitution. These were the political and permanent staff of the British Colonial Office who, alongside the already-familiar “Fathers of Confederation,” drew up the provisions of the British North America Act that continue to shape politics today. Notwithstanding the Confederation debates, the recent furore surrounding Ontario’s use of the Charter’s overriding clause suggests that Canada’s constitutional legacy is still far from settled, 151 years after its inception. See John T. Saywell, The Lawmakers: Judicial Power and the Shaping of Canadian Federalism (Toronto: University of Toronto Press, 2002). Ben Gilding is a PhD candidate at Christ's College, Cambridge. His research currently focuses on domestic responses to imperial crises in the British Empire in the “age of revolutions” (circa 1765–95). 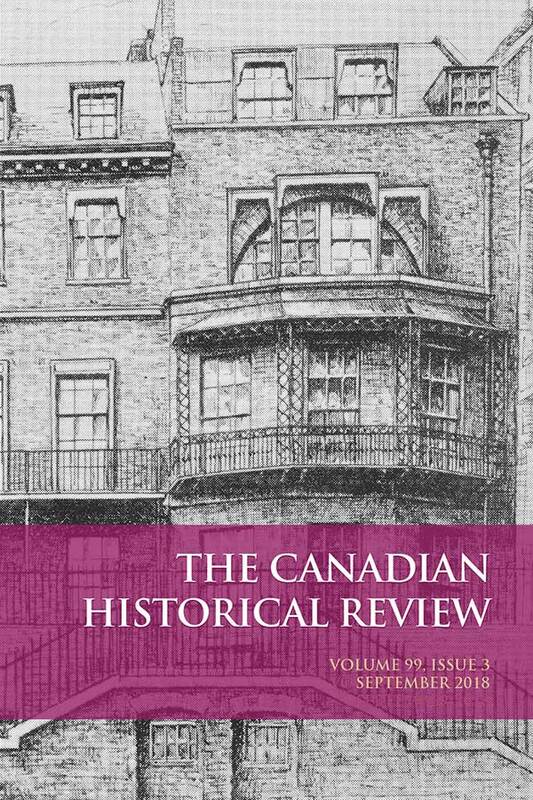 His article "The Silent Framers of British North American Union: The Colonial Office and Canadian Confederation, 1851–67 " is free to read in the latest issue of the Canadian Historical Review. Read it here! This entry was posted in Author Blog, Journals and tagged Dominion, Canadian Historical Review, Confederation, empire, colonialism, Britain, politics, Canada on October 19, 2018 by Amber Dilabbio. While the American Thanksgiving is steeped in nationalism, ritual, and history, the origins of the Canadian version are a little less clear, with few of us actually knowing where the holiday comes from. If this makes you feel mildly guilty, focus that energy on your cranberry sauce instead. We’ve got you covered with the context you’ll need to impress your guests this Thanksgiving weekend. For answers, we turned to Celebrating Canada: Holidays, National Days, and the Crafting of Identities, from editors Matthew Hayday and Raymond B. Blake. From the pages of Peter Stevens’s essay on where it all began – think church, Brits, and our neighbours to the south – learn how Thanksgiving was always meant to be a day to celebrate being Canadian. In the United states of America, few annual events stir the national imagination as thoroughly as Thanksgiving Day. The holiday’s rituals and symbols harken back to the nation’s founding fathers, evoking images of pilgrims landing at Plymouth Rock and sharing a harvest feast with the surrounding Native peoples in 1621. The myth of this first Thanksgiving, which is a staple in the education of every American schoolchild, informs U.S. citizens that their country is a land of opportunity and new beginnings, a place of piety, abundance, and inclusivity. Other Thanksgiving customs uphold family, consumerism, and competition as core American values. The holiday is a favourite occasion for get-togethers with friends and relatives, with festivities revolving around turkey dinners, Santa Claus parades, and football games, all unfolding against the backdrop of autumn leaves and newly gathered crops. Scholars have parsed American Thanksgiving in considerable detail, and there is a lively debate over which Thanksgiving traditions are rooted in historical fact and which are based in fiction. What is beyond dispute, however, is the overtly nationalistic character of the day. In the Canadian context, by contrast, Thanksgiving Day is surrounded by ambiguity. Media reports regularly express doubts about the meaning and purpose of the holiday, while Canadians themselves often seem unsure about how their Thanksgiving differs from the American one, and why the two holidays do not share the same date. Thus far, scholars have offered few answers to these questions, as academic treatments of Canadian Thanksgiving are scarce, speculative, and limited in their analysis. Significantly, these works downplay the holiday’s importance as a patriotic celebration, making only passing reference to a “subtle influence of Canadian nationalism” that is evident on Thanksgiving Day. This chapter cannot relate the entire the history of Canadian Thanksgiving, but it does take up the beginning of the story by examining the origins of the holiday in late-nineteenth-century Ontario. In doing so, it reveals that Canadian Thanksgiving initially had a nationalistic focus that it since has largely lost. In the minds of the men who first developed the holiday, Thanksgiving was intended to be a day for celebrating Canada. The existing literature on national public holidays in North America raises several points that help to illuminate the specific history of Thanksgiving Day in Canada. First, while public holidays often appear to be age-old celebrations that emerged organically out of the national fabric, they are actually examples of invented traditions. According to Eric Hobsbawm, an invented tradition is “a set of practices, normally governed by overtly or tacitly accepted rules and of a ritual or symbolic nature, which seek to inculcate certain values and norms of behaviour by repetition, which automatically implies continuity with the past.” Holidays, as annual events that are steeped in ritual, constitute a powerful form of invented tradition, for while they seem to be neutral and apolitical, they are actually compelling advertisements for the world views of those who shape and promote them. Second, public holidays often serve as important tools of nation building. Holiday customs and iconography give members of a population a sense of a shared past and subtly inform them about who they are as a people. By reinforcing messages about common values and experiences, holidays thus encourage individual citizens to imagine themselves as being members of the same political community, or nation. This is not to suggest that the meanings of holidays are static, however. Because holidays are such potent expressions of national beliefs, ambitions, and identity, they become temporal battlegrounds in the cultural contests between different interest groups. Holidays are contested terrain, and their meanings can change over time as they are controlled and influenced by groups that have competing visions for the nation. Where Canadian Thanksgiving is concerned, the figures who were most responsible for establishing the celebration on an annual basis were Protestant clergymen in Ontario. Their interest in the holiday was primarily a response to two great challenges that faced them, as Canadian church leaders, beginning in the second half of the nineteenth century. Particularly after Confederation, ministers felt a moral and historical obligation to chart Canada’s course. At the very moment that preachers most sensed a call to lead their country, however, global intellectual developments issued challenges to Christianity so fundamental that they threatened to dissolve many Christians’ faith. The American Thanksgiving holiday revealed to church leaders a means by which they could restore Canadians’ confidence in Christianity and secure their own positions at the helm of the young country. Ontario clergymen did not simply duplicate the American Thanksgiving festival, which by the 1860s had evolved into a national public holiday. Rather, they recast Thanksgiving as a predominantly religious event and naturalized the holiday by steeping it in Canadian nationalism. Ontarians responded positively to this mix of Protestantism and patriotism, and ministers successfully instituted Thanksgiving as an annual holiday in Ontario. Once Thanksgiving became a yearly event, however, other cultural interest groups increasingly challenged Protestants’ holiday hegemony. As a result of these challenges, the Thanksgiving that Ontarians marked on the eve of the Great War was little like the holiday that clergymen had established several decades earlier. Yet, one aspect of the holiday remained unchanged: its nationalist content. Although Thanksgiving acquired many new meanings and customs, it remained throughout the Victorian period a day for Ontarians to celebrate their status as Canadians. The early history of Thanksgiving Day in Ontario contributes to discussions of religion in late-nineteenth-century Canada by highlighting the prominent but waning influence of Protestant church leaders within the public sphere. It also complicates our understanding of Canadian patriotism during this critical period in the country’s history. In particular, the origins of Canadian Thanksgiving demonstrate the complex and sometimes contradictory ways that citizens of the new dominion sought to define themselves in relation to both Great Britain and the United states. In this respect, Thanksgiving Day had much in common with Dominion Day, Empire Day, and other public celebrations of the era, which likewise sought to define Canadian identity in reference to both Britain and the United States. Read Stevens’s full article in Celebrating Canada: Holidays, National Days, and the Crafting of Identities. This entry was posted in Books, Excerpts, Miscellaneous, Politics and tagged National Days, Canadian Thanksgiving, Canadian Holidays, Holidays, Thanksgiving, History, culture, Canadian History, Ontario, Canada on October 4, 2018 by Tanya Rohrmoser. Highlights from the months of June and July. Johannes Remy’s Brothers or Enemies was awarded the Ivan Franko International Prize of 2018. French Écocritique by Stephanie Posthumus is on the shortlist for the Alanna Bondar Memorial Book Prize. Daniel Quinlan represented UTP at the Law and Society Association’s annual conference in Toronto. Anne Brackenbury and Jodi Lewchuk presented our sociology list at the World Congress of Sociology in Toronto. A launch for Steven High's One Job Town took place in Sturgeon Falls on June 9. The North Bay Nugget ran an excerpt from High’s book. Northern Ontario Business interviewed High about his research for One Job Town. The Saskatoon Express ran a cover story on how Valerie Korinek’s research for Prairie Fairies was inspired by a message from a colleague on a post-it note. Global TV News Saskatoon ran a profile of Korinek and Prairie Fairies. Toronto’s Albany Club hosted a launch for From Wall Street To Bay Street by Christopher Kobrak and Joe Martin. The Globe and Mail interviewed Rick Nason about his book It's Not Complicated. The Globe and Mail interviewed Luciara Nardon about Working in a Multicultural World. Prairie Fairies by Valerie J. Korinek landed on Chronicle of Higher Education's Weekly Book List for the week of July 6. Gentrifier by John Joe Schlichtman, Jason Patch, and Marc Lamont Hill was featured in a piece on the tone deaf marketing of gentrifying neighbourhoods in The Philadelphia Inquirer. Christopher Alcantara talked about his latest book A Quiet Evolution with Western News. "Miscarriages of Justice In Canada is a darkly compelling book not because it is sensational, but because it is so matter of fact," writes Holly Doan, in a review for Blacklocks Reporter. Cultures of the Fragment: Uses of the Iberian Manuscript, 1100-1600 by Heather Bamford. Queering Urban Justice: Queer of Colour Formations in Toronto edited by Jin Haritaworn, Ghaida Moussa, and Syrus Marcus Ware, with Río Rodríguez. Preaching Apocrypha in Anglo-Saxon England by Brandon W. Hawk. New Brunswick before the Equal Opportunity Program: History through a Social Work Lens by Laurel Lewey, Louis J. Richard, and Linda M. Turner. Writing by Ear: Clarice Lispector and the Aural Novel by Marilia Librandi. Erasmus and His Books by Egbertus Van Gulik | Translated by J.C. Grayson and edited by James K. McConica and Johannes Trapman. Regulating Professions: The Emergence of Professional Self-Regulation in Four Canadian Provinces by Tracey L. Adams. Geometry of the Passions: Fear, Hope, Happiness: Philosophy and Political Use by Remo Bodei | Translated by Gianpiero W. Doebler. Aristotle's Science of Matter and Motion by Christopher Byrne. Machiavelli and the Politics of Democratic Innovation by Christopher Holman. Iberianism and Crisis: Spain and Portugal at the Turn of the Twentieth Century by Robert Patrick Newcomb. This entry was posted in Awards, Books, Events & Conferences, In the News, Miscellaneous, New Releases, UTP News and tagged New Releases, History, higher education, Canadian History, Books, Awards, University of Toronto Press, University of Toronto, UTP, Author Blog, Canada, UTP News, Events, Conferences on August 17, 2018 by Ankit Pahwa.